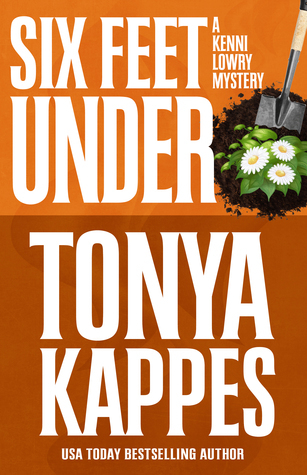 I just finished my review of Six Feet Under by Tonya Kappes. I hadn't read any in this series before, but I really enjoyed it. I would like to share my review here too. In Six Feet Under by Tonya Kappes, we meet Kenni Lowry the local sheriff for the small town of Cottonwood Kentucky. A famous food critic comes to town to taste her mama's chicken pot pie. He meets his end there and Sheriff Lowry finds herself with another mystery to solve. This is the fourth book in the Kenni Lowry series. It's the first one of the series that I've read. I thoroughly enjoyed it. I found that I wasn't lost even though I hadn't read any of the others. I felt I knew all of the characters, although I had never met them before. They were fun and quirky keeping the story light and adding lots of humor. There were twists and turns in this mystery that will keep you guessing until the very last page. I would recommend this book to anyone who enjoys a mystery infused with quirky characters, a lot of humor and a bit of romance. I do enjoy doing book reviews. It's so much fun finding a great author and being able to share how I feel about a book. I hope it will attract someone else to their books. Izzy and Emma are doing great. They got some new toys and are busy playing.